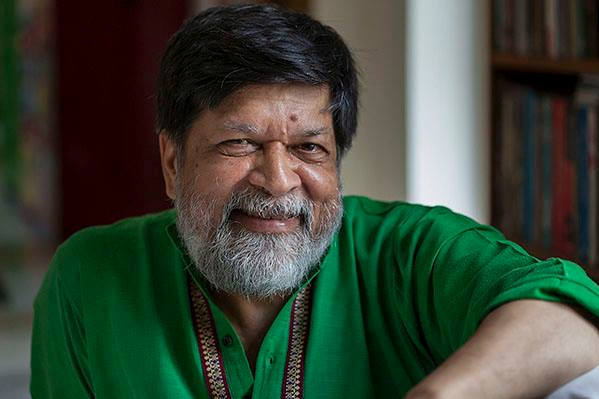 Shahidul Alam is a well known photographer around the world. Perhaps best known in press photography circles. Unfortunately, his work is not included in any photography history books I have come across. I first incountered Alam’s work in the catalog for Where Three Dreams Cross, a monumental exhibition of photographic works from Pakistan, India, and Bangladesh. This exhibition was held at the Whitechapel Gallery, London in 2010. Alam was born in Dhaka, Bangladesh in 1955. Today he is a photographer, curator, writer and human rights advocate. He holds a Ph.D. in Organic Chemistry from Bedford College, London University. He started his photographic career in London in 1980 and continued when he returned to Bangladesh in 1984. He set up “Fotoworld” that years as well as, became the secretary general for the Bangladesh Photographic Society. Throughout the 1980’s Alam worked as a freelance photographer. Then in 1990 he became an active participant in Bangladesh’s movement for democracy at which point he started making photojournalist work. It is this work he is most known for. Furthermore, it is images from this period that were in the exhibition Where Three Dreams Cross. 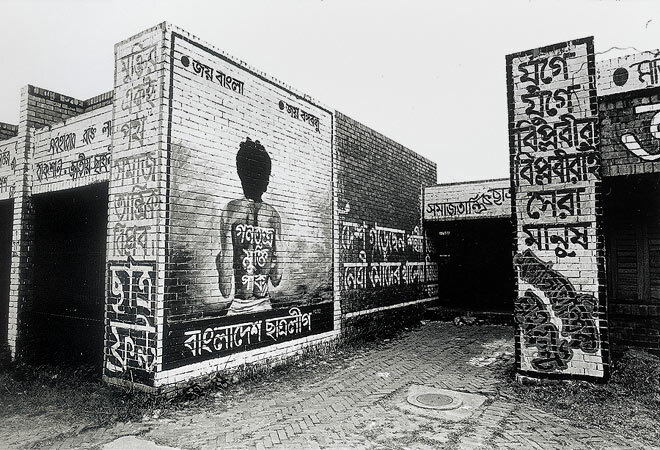 Shahidul Alam, ‘Let Democracy Live’: mural of martyr Noor Hossain on a campus wall, 1990, silver gelatin print. The photograph above is one of the photographs that most stands out to me in the catalog for Where Three Dreams Cross, it is that perfect photojournalist photograph. I can feel the mood, the tension in the photograph, even though it is devoid of people or action. It is one of those photographs that prove visual language can be understood, even when one can not understand the written or the spoken. Just before the movement of democracy took hold, Alam set up the DRIK picture library in 1889. 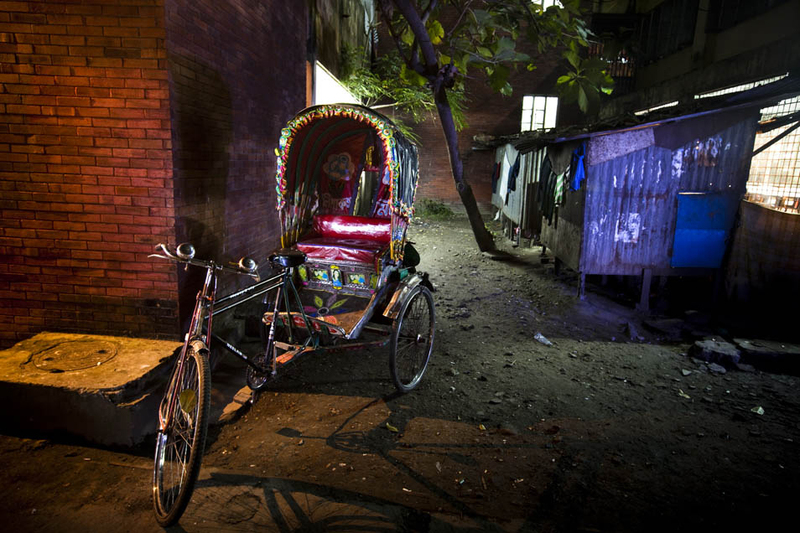 DRIK is still in existence today and provides photographs from Bangladesh to news outlets around the world. Another major accomplishment by Alam was the setting up of Bangladesh’s first email network in 1993. In addition to this Alam started the Pathshala South Asian Media Institute in 1998. Pathshala refers to the ancient education system of holding classes under large trees. Furthermore, Pathshala is known as one of the leading photography schools in the world. It attracts students from Bangladesh and around the globe. Alam is also the founder and director of Chobi Mela: An International Photography Festival. It is the first and longest running photography festival in Asia. I was lucky enough to attend Chobi Mela VIII (you can read about that here Chobi Mela VIII). It was an amazing experience. The photo work was global in its scope and the exhibitions were held in various venues across the city. It gave visitors a chance to explore many different areas of the city. Furthermore, exhibition were held at both DRIK and Pathshala, so I was able to visit both of these locations. For me the lectures at the Chobi Mela were key. I was truly able to get another perspective on photography. It was nice to see why photography matters in a different way than the Post-Modern notions I am educated in and my work follows. Alam was obviously present at the Chobi Mela and he lead a panel discussion by the curators of the festival. The impression he left me with was one of an educated and well rounded man. He had this air about him. I found him intimidating, not in a scary way, but because of his mind, his intelligence. I am a super shy person, so I never approached him or said anything to him. Perhaps one day I will get the chance again. Alam has traveled the world making photographs fifty eight countries. His contribution to photography goes far beyond the photographs he has given us. His passion for the medium has inspired people around the world through his initiatives to disseminate photography though education and the Chobi Mela. You can check out Alam’s work on his website shahidulalam.com. Furthermore, you can find out more about his publications but monographs and writings by him. Be sure to look at the project Crossfire. It is my favorite body of work. The photo’s posses the same intensity as the image seen above. Biographical information was obtained from shahidulalam.com and from Alam’s book My Journey as Witness. Published by Skira, Italy, 2011.